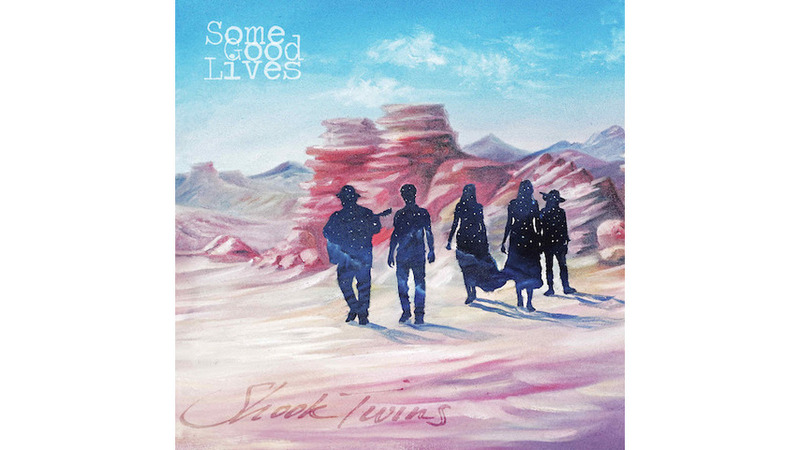 Some Good Lives, the fourth album from Portland, Oregon folk duo Shook Twins, led by twin sisters Laurie and Katelyn, opens on a party track, ends on an afterparty track, and in between sandwiches almost 40 minutes of ennui and melancholy. It’s all baked into the song titles: “Figure It Out,” “Got Your Message,” “Wantlove,” “No Choice,” “What Is Blue.” There’s even a tinny 30 second rendition of “Moonlight Sonata” as a brief intermission from the Shooks’ original contemplative work. A handful of songs, like “Buoy” and “Stay Wild,” encourage boogie-ing, perhaps even grooving, but they’re the exceptions that prove the rule. Pensive vibes aside, the Shook Twins’ party remains a party you’ll want an invite to. Some Good Lives moves away from their pop-forward roots into bluer territory. Not bluesy but considerably more wistful, as if the pair’s had much on their minds in the five years since the release of their last record, What We Do, and can only genuinely express it through a cooler, ruminative sound. But to move away from one’s roots isn’t to betray them, or if it is, it’s not necessarily a bad thing. Some Good Lives often goes downbeat, but the tone doesn’t stop it from being beautiful, or worth listening to. Rather it’s an acquired taste, or a taste not for all occasions. Give the Shooks their right to reflect instead of play happy. “Happy,” after all, is a word for yoga studio devotees and kids’ show hosts, and odds are that anyone belonging to one group or the other is burdened by problems bury under stretched and strained smiles. Some Good Lives fakes nothing. It’s honest. There’s a forthrightness to its narrative, a product of confession through art. “Don’t get caught in the cold crying / there’s nobody coming this time,” goes the second verse “Figure It Out,” just before the reprise. “What did I explain?” The track rings with chimes and bells, the references to temperature combining with instrumentation to evoke winter’s advent. The chill in the lyrics and the music lends the lovely tune a forbidding, even merciless undercurrent, not exactly what listeners might expect from the Shooks’ aesthetic. They’re talking about maturity, of course, and the painful experience of growing up in an unforgiving world. It’s unassumingly heavy stuff. (Perhaps explaining the song’s nuance and layers is the participation of one Gregory Alan Isakov, with whom the Twins worked on the track at his Colorado studio.) That heaviness extends to “Safe,” too, in which the pair beseech their audience, indisputably intended to be a romantic partner, to stay over and over again, if not for the night then at least to talk. “I am trying hard to make it feel right, but it’s not right, because there’s nothing moving,” they murmur, trying, with as much force as they can muster, to catch their lovers’ attentions. Whatever “it” is, they have to work it out, but that means blunt-force truth-telling. That kind of candor doesn’t come easily, but on Some Good Lives, it’s certainly easy to listen to. purposeful, with a sprinkling of revelry. These things aren’t mutually exclusive, but Some Good Lives so determinedly muses over subjects ranging from love to loved ones that its brighter numbers feel less like tonics and more like distractions. They’re delightful distractions, fortunately, reminders that the Shook Twins have real sonic versatility. Maybe the next party they throw should just stick to a single theme.